Several Victorian writers had remarked on the various banks and ditches in Sutton Park, speculating on their significance, and then in his 1904 book A Short History of the Town and Chase of Sutton Coldfield William Midgley wrote “Some warring celtic tribes on this wild upland had scooped out, with their rude bronze mattocks, earthworks from behind which they could shoot their arrows. And here they remain to this day.” But another writer, G.H.Benton, writing in 1906, speculated that the earthworks were something to do with the deer park. A detailed survey of all the ditch-and-bank earthworks in Sutton Park was made in 1977 by Michael Hodder, who identified over twenty different types. The longest boundary bank, running along the edge of the Park from Banners Gate to Four Oaks, was attributed to Bishop Vesey, who is known to have paid for making earthworks in the Park in the 1530s. Two other earthworks were traced forming a large enclosure, and these were interpreted as the boundaries of a twelfth century deer park. Mike Hodder reported his findings in the Transactions of the Birmingham and Warwickshire Archaeological Society in 1980 - “The outer ditch and bank are Vesey’s 1530s work…the inner enclosure is a medieval deer park…it is centred on the Manor House (the medieval manor house stood on top of Manor Hill)…it has an internal ditch…its perimeter is woodland with a laund or open pasture in the centre…and it includes streams and three medieval pools (Wyndley, Keepers and Cross Pool).” The size of the enclosure, about one square kilometre, or 250 acres, was similar to other known medieval deer parks. This interpretation fitted with the grant by King Henry I to the Earl of Warwick in 1126 of the Manor of Sutton together with permission to have a deer park and eighteen fallow deer. However, further study of the outer earthwork convinced Mike Hodder that this was also the remains of an early deer park boundary, possibly pre-dating the inner park. The assumption now is that Sutton Park was laid out by King Henry I in the early years of the twelfth century while the manor of Sutton was still held by the king. This very large park, of over 2,500 acres, was similar in size to King Henry I’s first deer park, made at Woodstock in 1100, of about 2,700 acres. The inner park is either a later sub-division of the park for the better management of the deer, or, when smaller deer parks became the fashion later in the twelfth century, a new park. The present-day surviving earthworks are puny compared with their original size, thanks to erosion of the banks and the silting-up of the ditches, being only one metre high from the bottom of the ditch to the top of the bank, whereas excavation has shown that the original base of the ditch is half a metre below the present level - if a similar amount has been lost from the top of the bank, a deer in the ditch trying to escape from the park would be faced with a leap of two metres to get over the bank, not to mention the fence on top. 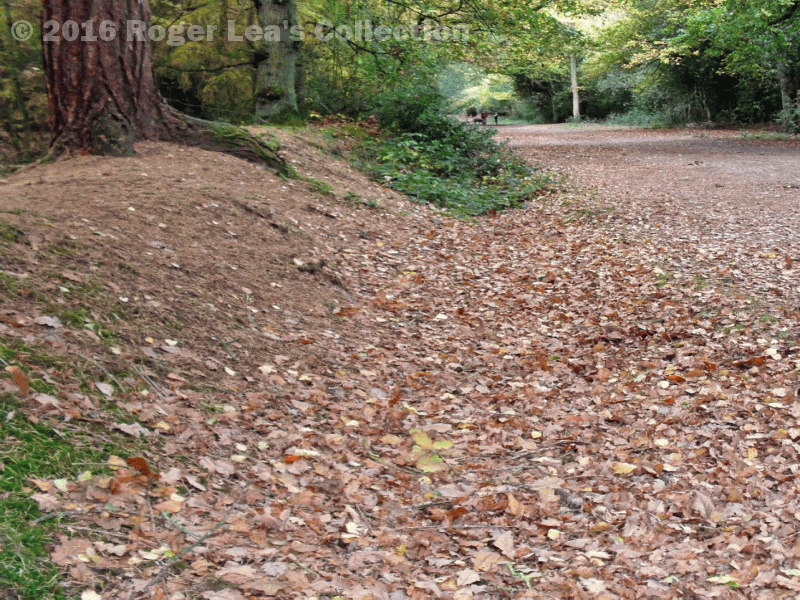 An earthwork in Sutton Park - material has been washed away from the top of the bank, exposing the tree roots, while the ditch is filled with fallen leaves.